Investigadores asociados colaboran con los proyectos de LAPOP de numerosas maneras, estos incluyen expertos en temas específicos, expertos en países, socios locales, autores de informes, asistentes de investigación y más. Dr. John Carey, Dartmouth College, E.E.U.U. Oscar Castorena, Vanderbilt University, E.E.U.U. Jaymee Cole, Vanderbilt University, E.E.U.U. Miguel Cuj, Vanderbilt University, E.E.U.U. Pawel Durakiewicz, Vanderbilt University, E.E.U.U. Dra. Rosario Espinal, Temple University, E.E.U.U. Julia Gabriel, Vanderbilt University, E.E.U.U. Caleb Harper, Vanderbilt University, E.E.U.U. Shelby House, Vanderbilt University, E.E.U.U. Christine Huang, Vanderbilt University, E.E.U.U. Claire Larson, Vanderbilt University, E.E.U.U. Dr. Noam Lupu, Vanderbilt University, E.E.U.U. Alexandra Lynn, Vanderbilt University, E.E.U.U. Dr. Trevor Lyons, Vanderbilt University, E.E.U.U. Dra. Mary Malone, University of New Hampshire, E.E.U.U. Morgan Márquez, Vanderbilt University, E.E.U.U. Noemi Monnerville, Vanderbilt University, E.E.U.U. 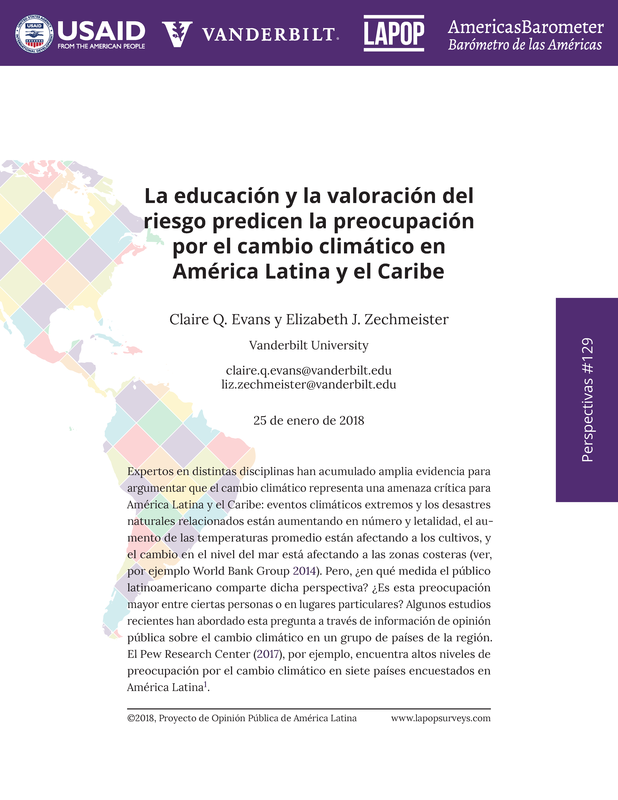 Lizzie Naylor, Vanderbilt University, E.E.U.U. Georgia Nilsson, Vanderbilt University, E.E.U.U. Dr. Brendon Nyhan, Dartmouth College, E.E.U.U. Daniela Osorio, Vanderbilt University, E.E.U.U. Lachanda Reid, Vanderbilt University, E.E.U.U. Gui Russo, Vanderbilt University, E.E.U.U. Facundo Salles, Vanderbilt University, E.E.U.U. Hannah Stack, Vanderbilt University, E.E.U.U. Lawrence Waller, Vanderbilt University, E.E.U.U. Bryce Williams-Tuggle, Vanderbilt University, E.E.U.U. Adam Wolsky, Vanderbilt University, E.E.U.U. Michael Zoorob, Vanderbilt University, E.E.U.U. *Miembro de la Junta de Planificación del Barómetro de las Américas 2016/17. **Presidente de un Comité Asesor de la Junta de Planificación del Barómetro de las Américas 2016/17.